A familiar face has returned to run the namesake business he had previously been leasing to another group. Junior Somboon of Somboon Auto Group is back in business at 4501 N. Clark. Lots of neighbors in the area have praised the quality auto work his team does and are happy to see him back at the corner of Clark and Sunnyside. The Yelp reviews are great as well. 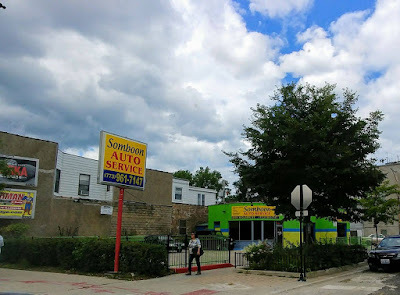 If you are looking for an auto mechanic in the area, stop by and get an estimate. You can also expect to see the shop's interesting choice of paint color to be changed soon. We welcome Junior back to Sheridan Park!